Our air-conditioned car rolled through the sultry heat as we drove down a cool and tree-lined road running parallel to the beautiful old Delaware and Raritan Canal, just a few miles from Princeton, New Jersey. We slowed down to witness a remarkable sight: a so-called piebald deer, white with a few brown patches, a condition apparently caused by a recessive gene and found in about one out of every one thousand white-tailed deer! It walked slowly across the road and into the woods, then stopped and turned around and stared at us. 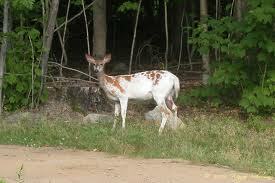 And we stared back at the piebald deer. Was this a princess in disguise? Were these magicial woods? Was she seeking love or fleeing it? Was she fading to white? Or was her color returning?